On March 8, 2013, the Japan Foundation Cairo Office invited Japanese anime song singer Hironobu Kageyama (his representative work is an opening song of the anime series titled Dragon Ball Z) to Egypt and held the first-ever anime song concert in the Middle East. We held the Grand J-POP Culture Festival on the same day and had more than 800 visitors. Egyptian youth were so impressed by that festival which had a cosplay show, a Japanese song singing contest, an exhibition of manga and illustration of Egyptian manga artists, Manga café, a cosplay rental section, and Origami and Shodo workshops, etc., and they had decided to hold an anime and manga event by themselves. Anime and manga convention “EGYcon” was first scheduled to be held on August 30, 2013, but just before the event, Egypt got into political instability, especially after Egyptian security forces cleared pro-Morsi camps in Cairo on August 14. Egypt’s interim government declared a state of emergency across the country and imposed a night-time curfew, and thus the “EGYcon” was postponed. 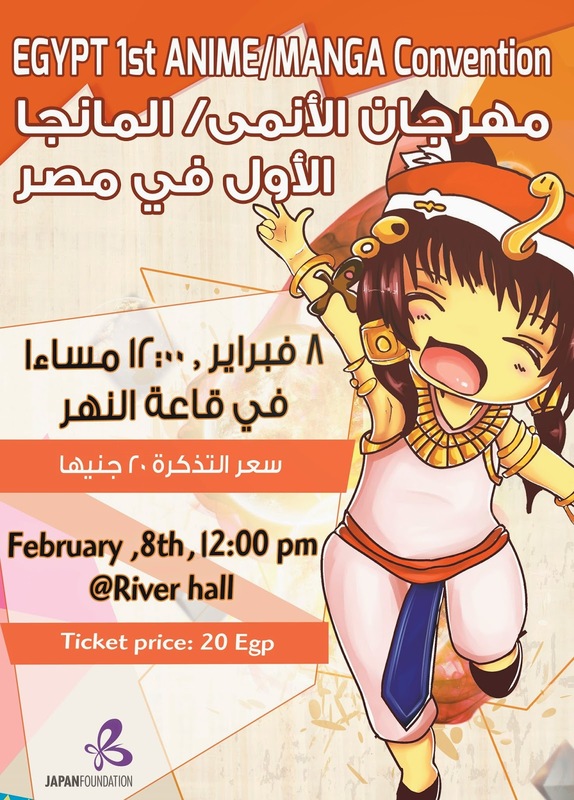 Despite political instability, OTAKU had kept having passion for hosting “EGYcon”, and it finally took place on February 8, 2014 at Sakia Culture Centre in Cairo. There were more than 1500 visitors to the “EGYcon” and I felt full of energy of Egyptian OTAKU at the venue. I would like to show you around the “EGcon” venue. Here is a section consisting of an Egyptian manga artists’ exhibition and portrait drawings. We had only one manga group “Egy Manga“ last year, but now we had “COMICORE” & “Comic life”, too! They had a high level of manga drawing technique, but had a problem of creating an original story. In Egypt, there are manga artists who contribute caricatures to newspapers or magazines and who draw American comic-like manga for children, but there aren’t a “Japanese-style, story-oriented manga” for adult. Publishers have a stereotype image that manga is only for children. Although Egyptian youth create this kind of Japanese-style, story-oriented manga, there is no way opening up for them to publish it. But they haven’t given up and have worked hard to publish self-funded “DOJINSHI”, with the aim of showing their story-oriented manga to the public. Egy Manga, a group who published the first-ever Egyptian "DOJINSHI"
The Japan Foundation Cairo Office has YUKATA and HAPPI, Japanese school uniforms, and also some cosplay costumes. The Japan-Egypt youth exchange group Jen Youth hosted this “Cosplay Costume Rental” section, and provided visitors opportunities to enjoy wearing those costumes and taking photos. Visitors enjoyed reading Japanese manga magazines such as JUMP, Margaret and other anime and fashion magazines at the café. Staff members and volunteers of the Japan Foundation taught Origami and wrote visitors’ names in Arabian language by Shodo (Japanese calligraphy). It was very glad to see that people with an interest in anime and manga also get interested in Japanese traditional culture through participating in such cultural events. Visitors enjoyed various stage performances at Egycon. Rock bands “Entity X” from Alexandrea played anime songs of the popular series such as NARUTO, Attack on Titan. Although it was only an instrumental performance due to the absence of the band’s vocal, visitors got very excited and the concert went very well. For “Anime Stand-up comedy“, Egyptian Otaku created their original comedies themed on anime and manga and presented them at stage. It was very much like an “OTAKU” performance! It is an anime song show. 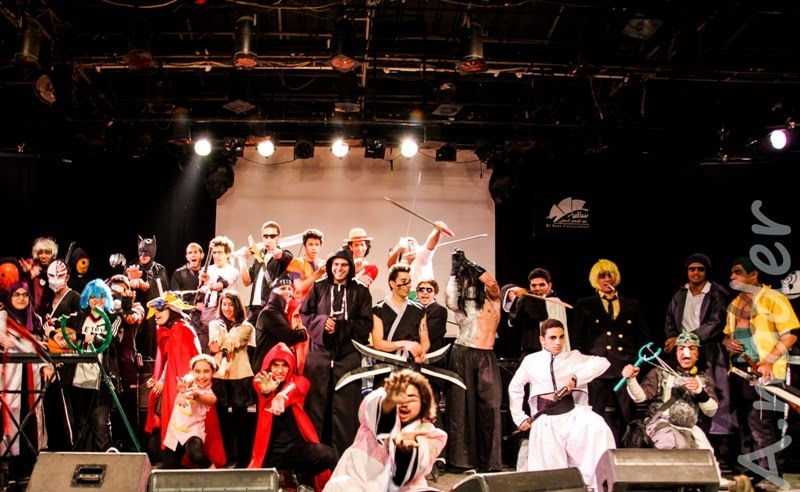 With great enthusiasm, participants sang Japanese anime theme songs such as Naruto, Hunter × Hunter, and Pokemon, in Arabic and also in Japanese. More and more people get interested in COSPLAY in Egypt. We had anime characters of “L” from Death Note, “Ichigo Kurosaki” from Breach, “Sanji” and “Zoro” from One Piece, and these cosplayers gave us the short performances. ”GOKU” from Dragon Ball was showing breakdance! We also had a pretty little “Conan“ girl at the show. “Egyptian Taijyutu dojyo”, a group of Egyptian practitioners of Japanese martial arts “Taijyutsu”, gave a performance at Egycon! Local TV channels Rotana Masr and Nile TV (French) and Japanese TV channels NHK and NHKWORLD covered the event. When we had the anime and manga event last year, it was very hard to let Egyptian understand what COSPLAY is. But this year Egyptian media used the term COSPLAY in their news as if it was a widely-known general word. Egyptian Otaku, who used to enjoy anime and manga at home alone, met many other OTAKU at this Egycon festival and created a new bond among them. And they have already started to plan organizing other anime and manga events together and have brought many project proposals to the Japan Foundation Cairo Office. Anime and manga movements have just begun in Egypt and I am looking forward to see its expansion in the future!